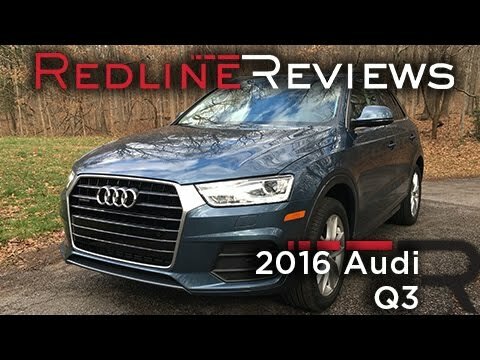 The Audi Q3 was an early entry in the new compact-luxury SUV market, and it's helping define the segment. The smallest of Audi's "Q" crossover SUVs, the Q3 isn't as fun to drive as the BMW X1, but the Audi's quality fit and finish and pleasant road manners are similar to those of its bigger brothers. Think twice about an Audi. I really love how fast my Audi is. I also like the heated seats and that the rear view and side mirrors are tinted which is nice at night or when bright lights shine through your car. However, the car is a bit small. With a car seat in the back behind the passenger's seat, your knees will touch the dashboard. The car is a bit small if you have a family you will need the bigger model. It has power. Even though it is a v4, it has a lot more power than most v4’s. I absolutely love my car. I used to drive an escalade to work and the amount of gas I spent was ridiculous. I got the Audi because it is a smaller SUV but the performance is still amazing, it is still powerful but I spend a lot less on gas weekly. It is great in the snow, drives awesome in the rain & it is spacious enough for my family of four plus our dog. Audi completely fits me. I love the way it drives, steers, and holds the road. I love my small Audi. It is 4 doors, collapsible back seat for larger items. It has a large trunk. It is keyless entry which I love! It has a great sunroof I use all the time in good weather. It has Bluetooth, CD player and Sirius radio- love them all! It has heated seats for cold days. I love the way an Audi drives and holds the road. Volkswagen Group of America, Inc. (Volkswagen) is recalling certain 2016-2017 Audi Q3 vehicles. If the parking brake is used during emergency braking, the brake lights on the vehicle will not activate. As such, these vehicles fail to comply with Federal Motor Vehicle Safety Standard (FMVSS) number 108, "Lamps, Reflective Devices, and Associated Equipment." Audi will notify owners, and dealers will update the vehicle software, free of charge. The recall began July 31, 2017. Owners may contact Audi customer service at 1-800-253-2834. Volkswagen's number for this recall is 45G6.